All the pre-game talk around Vicarage Road concerned the bold change of formation that incorporated both Diego Fabbrini and Fernando Forestieri in a front three. 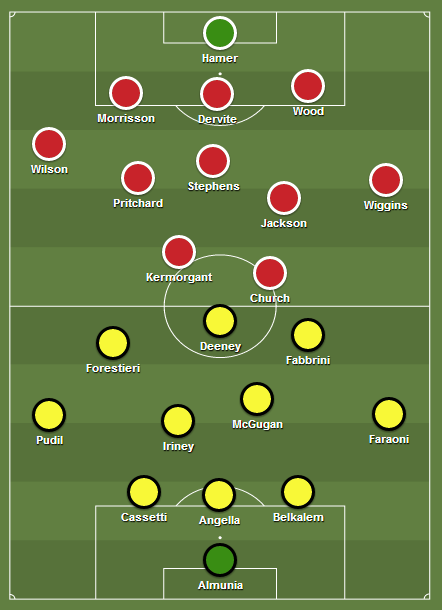 While Charlton lined up in the 3-5-2 formation that Watford did so much to resurrect in the Championship last season, it remains to be seen if the Fabb/For combination will become as big as the Beatles. This first outing of the system was unconvincing, though not as disastrous as some online commenters made it seem. While Forestieri and Pudil on the left got quite a lot of change out of the girly-haired Lawrie Wilson; Fabbrini and Faraoni were kept largely silent by one-time Watford target Rhoys Wiggins on the right. In the first half, Forestieri carved out two good chances from flowing team moves, both of which he bent the wrong side of the far post. The Italian (not an epithet that holds much distinction these days) was bubbly though not at his best. His colleague on the other side of the pitch, however, was poor. His touch was constantly too heavy and when on the ball his eyes, as usual, were planted firmly at his own feet and not at any developing space for teammates. After a bright start which produced those two openings for Forestieri, Watford retreated into their shell a bit. The defence were rarely troubled, and indeed played the ball out of danger with calm panache, but the two man midfield comprising of Iriney and Lewis McGugan were outnumbered by Charlton’s central three, and found it hard to keep the ball. It all became a bit too ponderous. There was the short passing that we’re now well accustomed to, but it didn’t really go anywhere. The ball would naturally migrate to the left, where space would be snuffed out and the ball lost. The flowing passing moves that the defence were putting together under pressure papered over the cracks in communication that obviously remain. A lapse in judgement from Angella led to Belkalem taking a caution for the team on the edge of the box – a yellow that could easily have turned to red later in the game – and the marking on set pieces was haphazard and worrisome. Less than a minute after the half time break, Charlton were ahead. Bradley Pritchard played in Wilson with a through-ball that wrong-footed Angella and the covering Belkalem poleaxed the midfielder with a rash challenge. Yann Kermorgant blasted the resulting penalty into the roof of the net. Watford were better in the second half: Scottish icon Ikechi Anya was brought on for Faraoni and made a world of difference down the right flank. Always looking to run in behind Wiggins, he provided the positivity and directness that is absent in Faraoni’s game. There were more nervy moments at the back, but chances for the Addicks were limited to Johnny Jackson firing over from a Wiggins cross. After 71 minutes, Fabbrini dawdled on the ball on the edge of the area before drilling in a low shot that Ben Hamer should have held, the ball dribbled to Pudil who poked in for the equaliser. The shape was changed shortly thereafter. It was, remarkably, Forestieri that gave way to Javier Acuña, who joined Troy Deeney up front with Fabbrini falling back into the hole. Ben Hamer was not tested nearly enough in the Charlton goal, but Watford had enough chances to win the game. McGugan hit the bar from eight yards with the whole of the goal to aim at after good work from Deeney and Troy then fired wide after a lung-busting pitch-long run from Anya. In the first half there was a real problem getting the ball to the target man, and his frustration was easy to interpret. But in the second he was more involved and it showed in Watford’s increased goal threat. But it didn’t come. Part of that could perhaps be blamed on the referee. Watford should have been awarded an indirect free-kick in the first half when a Charlton defender passed back to Hamer under pressure from Forestieri and a penalty should certainly have been awarded late in the game when Dorian Dervite blocked a shot from Sean Murray – on for Fabbrini – that was heading goalward. There was also an incident in the first half between Faraoni and Simon Church that had the Rookery riled up, though I must confess I didn’t see it. On the other hand, Belkalem was extremely lucky not to receive a second yellow for the foul that led to the penalty. Watford should have won the game on the back of their own chances, and to blame the officials is taking the easy way out. As the legendary NFL coach Chuck Noll once said to his players: ‘you have to play better than the refs ref’. There was an odd feeling surrounding the game. The defence was fine – if a bit erratic – and we had a few great chances to win the match, but it was just massively unsatisfying. It may be the pall of expectation that now suffocates Vicarage Road – the demand for positive results every week that permeates into even the most realistic fan’s subconscious. It was an average game, not particularly exciting or entertaining, the kind that used to populate Watford’s campaigns, but when walking away from the ground I felt a weird feeling that all was not right. Franco Zola said after the game that some things didn’t work how he wanted them to, and that he knew what needed addressing. There’s also the always-assuring presence of Lloyd Doyley and the creativity of Almen Abdi to return to the side. We’ll find out on Tuesday against Doncaster if he’s managed to address the issues that are, at the moment, holding Watford back.